We do not get snow at our elevation, but I could see it on the mountain tops. I took a photo from the grocery store, and it did not turn out as pretty as I thought it would. I think I need a telephoto lens. In the summer we do not even know those mountains exist because of the haze. It is so nice here after a winter rain storm, fresh and clean. I didn’t get much in the way of crafting done this week. I am still practicing various things on Belle while reading books on digitizing and quilting. At Beverly’s I found fabric to attempt my first small quilt . It is going to be a table top cloth for our breakfast area. I wanted something sunny and bright. I think these Happy Camper Fabrics from Moda will be fun. I have not done very much rotary cutting except for biases. So that and actually quilting will be a new experience. I took my BSR foot in to my dealer and had a heavier spring installed. I read on a Yahoo forum that it was recommended to eliminate skipped stitches on the 830. I think my BSR does work much better with the heavier spring. Before my stitches did not look even to me, now they do. Even though the heavier spring is not being recommended for other Bernina machines, several ladies have said they like how it works on their other machines too. Lots of ladies are lucky enough to have more than one Bernina. I did not have to pay for the upgrade, but I read it was only a few dollars for those that did pay. I hope everyone had a wonderful week and that next week will be even better. This entry was posted on Sunday, January 31st, 2010 at 3:00 am and is filed under Bernina 830, Quilting and Sewing. Tagged: Fabric, Life, Photo, Quilt, Sewing. You can feed this entry. You can leave a response, or trackback from your own site. Loving those cheery Moda fabrics you have chosen! What fun they will be to work with…be sure to post an image when your top is done! We need to balance things out – we have not received much snow this winter – it has all gone south and also on top of your mountains…just can’t figure what kind of weather pattern we are going through. 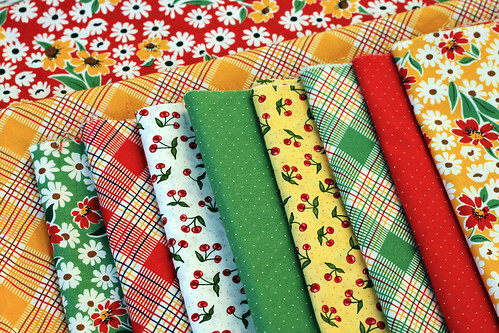 The Happy Camper fabrics are bright and cheery and will be perfect for your breakfast area. 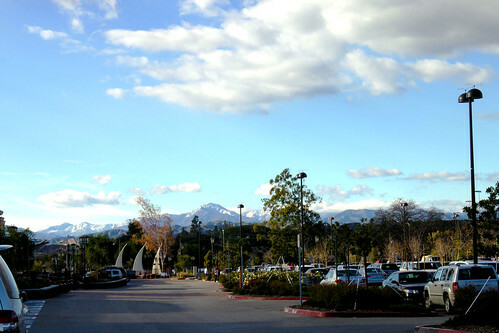 I’d love to look at snow covered mountains while leaving the grocery store!